Hungry Jack Mashed Potatoes Only $1.29 At Kroger - Over Half Off! 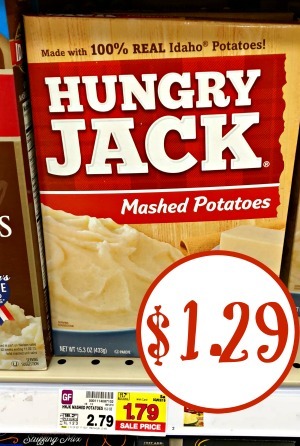 Hungry Jack Mashed Potatoes Only $1.29 At Kroger – Over Half Off! You can get a box of Hungry Jack Mashed Potatoes for only $1.29 after sale and coupon at Kroger! That’s less than half the regular price and a great option for a quick and easy side.